(L-R) Beast Boy voiced by GREG CIPES, Starfire voiced by HYNDEN WALCH, Cyborg voiced by KHARY PAYTON, Robin voiced by SCOTT MENVILLE and Raven voiced by TARA STRONG in Warner Bros. Animation's Animated Adventure "TEEN TITANS GO! TO THE MOVIES," a Warner Bros. Pictures release. “Teen Titans GO! 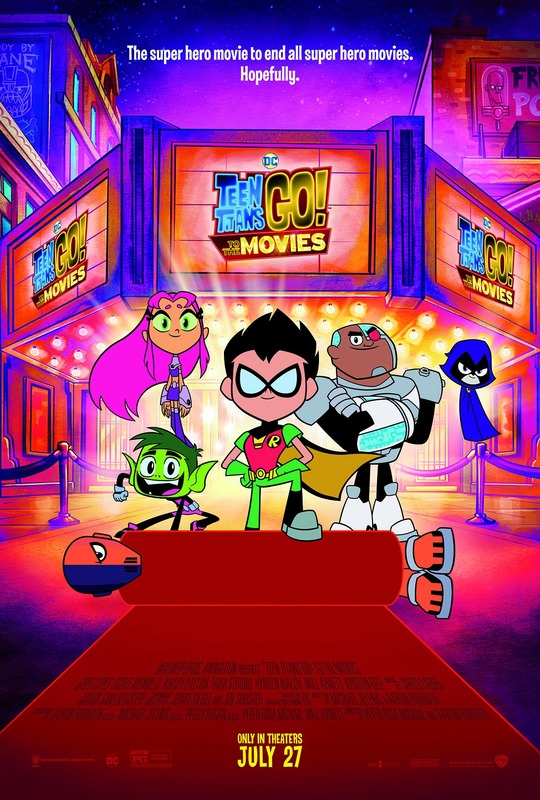 To the Movies” features the silly, scrappy, oh-so-lovable versions of DC Comics’ “Teen Titans” finally in their own movie! What’s it about? Well, it’s about them being in their own movie! If you enjoyed how “Deadpool 2” pushed the envelope as far as meta storytelling in the superhero genre, you’re in for a real treat here. This film doesn’t just push the envelope — it tears the envelope to shreds. That exactly what fans of this brand from DC Entertainment will walk into the movie expecting. Wait, a DC-property based movie meeting fan expectations? I know — weird, right? As stated earlier, “Teen Titans GO! To the Movies” find the titular heroes facing a grim reality. Every “real” superhero already has their own movie, but what about them? Are they not … real superheroes? This existential crisis hits the team’s leader, Robin (voiced by Scott Menville), particularly hard. 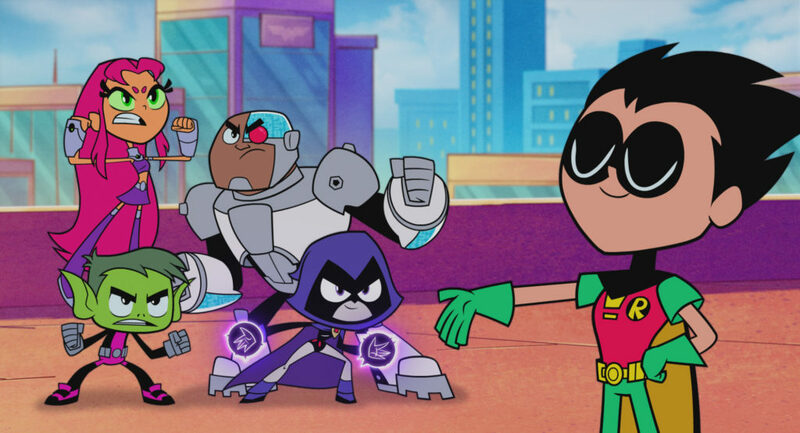 With his loving and supportive team behind him, he lobbies acclaimed superhero movie director Jade Wilson (Kristen Bell) to make a “Teen Titans” movie. Wilson, however, sees just a group of slackers and sidekicks. The Titans don’t even have an arch-nemesis – every “real” superhero has an arch-nemesis! And maybe THEN they’ll get their own movie! If all that sounds patently ridiculous to you, then you’re right where you’re supposed to be. “Teen Titans GO!” was a comedic, satirical spin-off of the original Cartoon Network “Teen Titans” series. It was always supposed to be a light-hearted take on the genre, focusing on what teen heroes did when they weren’t out fighting super-villains. “Teen Titans GO! To the Movies!” takes that concept to feature film heights. It brings more in-jokes, more slapstick and more gags targeted right at the superhero movie genre and its fans. Even the voice casting has an in-joke. Nicolas Cage provides the voice of Superman here — everyone remember when he was going to play a live-action Superman back in the 90s? But even taken at face value, as younger audiences will most likely do, “Teen Titans GO! To the Movies” is a lot of fun. It’s bright, it’s full of catchy songs (sorry, grown ups — the “sick beats” will get stuck in your head), and it’s often genuinely funny. The running gags here are priceless — watch how much mileage the gang gets out of saying their desired arch-nemesis’s name. “Slaaaaaaaaaade!” You can’t be a great arch-nemesis if you don’t have a name that’s fun to say dramatically. Everyone knows that! On top of all that goofiness, an amazing thing happens sometime during the film’s 90 minutes. You’ll find yourself rooting for the gang to finally get their due, and for Robin to figure out the moral of the story. For the gags, for the cameos, for the fun and for love of the Titans themselves, “Teen Titans GO! To the Movies” is absolutely worth taking the kids to see. Yes, it’s got fart jokes and some light crude humor. Believe me, it’s nothing the kids haven’t seen before if they watched the TV series. And speaking of series fans, Warner Bros. should pay close attention to the audience feedback they get from this one. This, along with the “Young Justice” brand, is the “Teen Titans” brand the company should focus their efforts on furthering. The “Titans” live action show coming to the DC Universe streaming service? Yeah, no — stick with this, and maybe a revival of the animated series that spawned it. Oh, and like any other superhero film, serious or not, stick around through the credits. Starring the voices of Greg Cipes, Scott Menville, Khary Payton, Tara Strong, Hynden Walch, Will Arnett and Kristen Bell. Directed by Peter Rida Michail and Aaron Horvath.